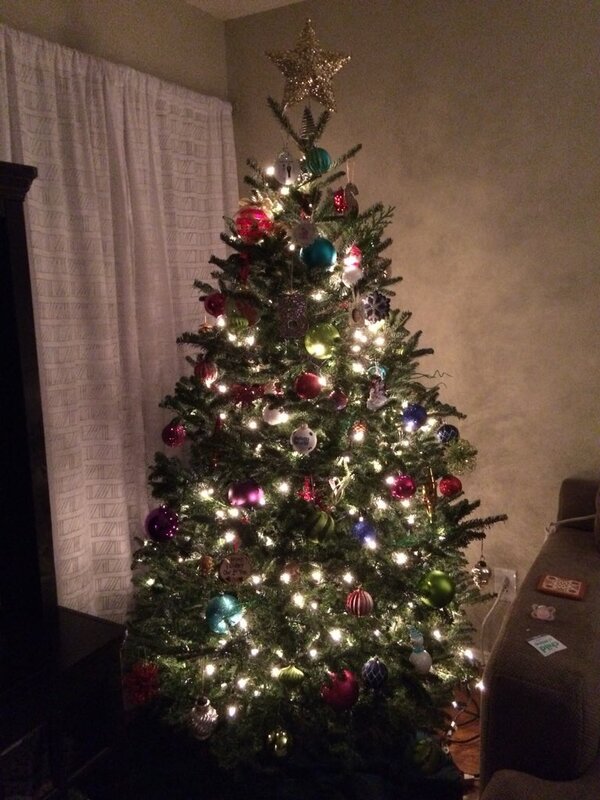 Our Christmas Tree – Let me start off this rundown on a positive Christmas note. Our tree is now set up and decorated! Sidney purchased it at Lowe’s (hardware store) for $30 on Black Friday. It is perfect! We have all my favorite ornaments on it from last year in addition to a few new ones. I like to walk Sloan up to the tree but I can only go so far until she starts yanking the ornaments off. This is our 2017 Christmas tree. Vandalism – Now let me continue this rundown on a negative Christmas note. Sidney used to work at a baby supply store called the Kangaroo Pouch. She is still close with the owner of the store. Earlier this week, a couple of hoodlums entered the business right before closing and overturned a giant nutcracker, completely destroying it. They then sprinted off. Law enforcement believes that the suspects did it for social media fame. Believe it or not, there is an audience on Snapchat and Instagram hungry for mean spirited pranks carried out by bored losers. To watch the video of the act, click here. To provide any information you know about the crime, contact the Myrtle Beach Police. 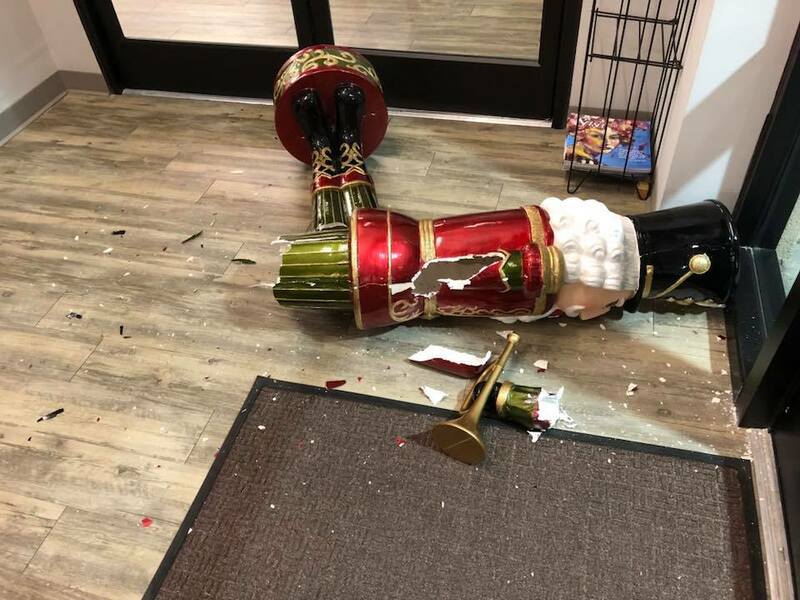 An oversized nutcracker inside the Kangaroo Pouch in Myrtle Beach was destroyed by two individuals who rushed the store right before closing (photo courtesy of Chris Richardson, Kangaroo Pouch owner). 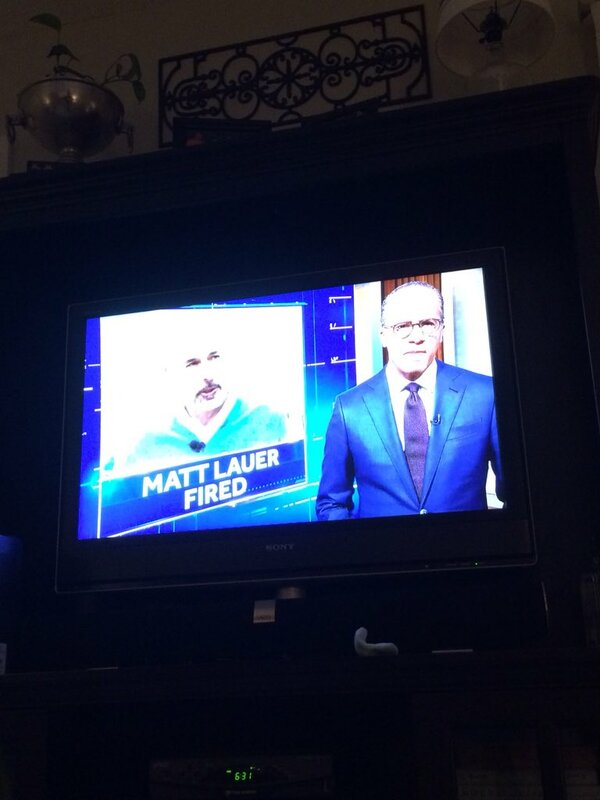 The Matt Lauer Coverage – The major headline yesterday was the firing of Matt Lauer. An icon in the news industry, his abrupt termination predictably caused a media firestorm. What intrigued me the most was the coverage his former employer gave the development. I watched NBC Nightly News last night as the surreal reality unfolded in front of my eyes as Lester Holt, a friend of Lauer’s, led off the broadcast detailing the fallout. The most interesting (or ironic) point came when the report mentioned that NBC News had reached out to Lauer for comment but he had not responded to inquiries. The company that welcomed the man into its studio for thousands of mornings over the course of 20 years, and that had just talked to him hours ago (albeit to fire him), could no longer even reach him for a statement. Although I understand that Lauer wasn’t going to say anything until he could release a statement on his own terms, it was just a weird moment. Photo I took of the NBC Nightly News broadcast last night as Lester Holt led off the program with Matt Lauer coverage. Sloan dressed up in her Christmas best to meet Santa. Sloan At 37 Weeks – Many times in the past week we have observed Sloan get on all fours and prepare to take off…only to stop at that point. Not that she has a problem getting around. Despite not crawling just yet, she uses a combination of rolling and shifting to get across our living room floor at a rapid rate. Want to make Sloan laugh? Just show her a video of herself! Our baby girl will break into a big grin and lightly laugh when we show her iPhone videos of herself. It is a pretty neat trick! 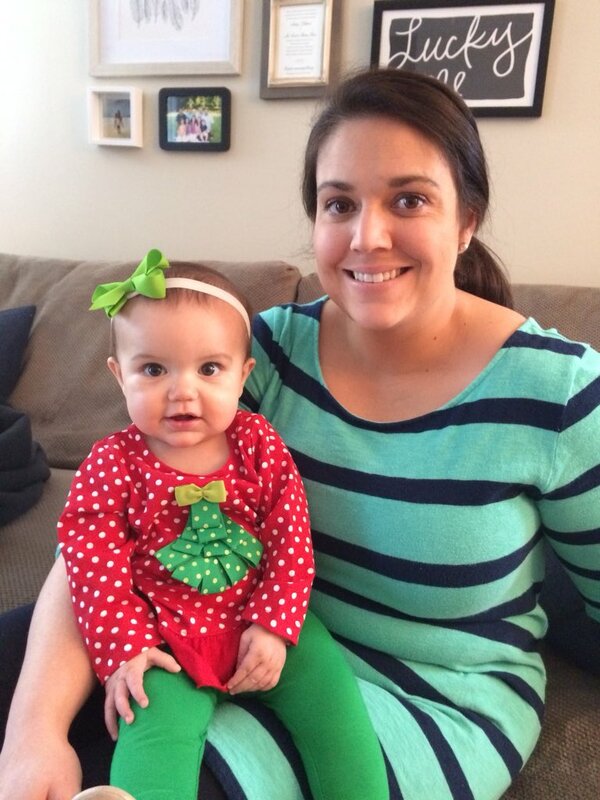 Sloan is doing great and we are excited for her to experience the magical month of December. 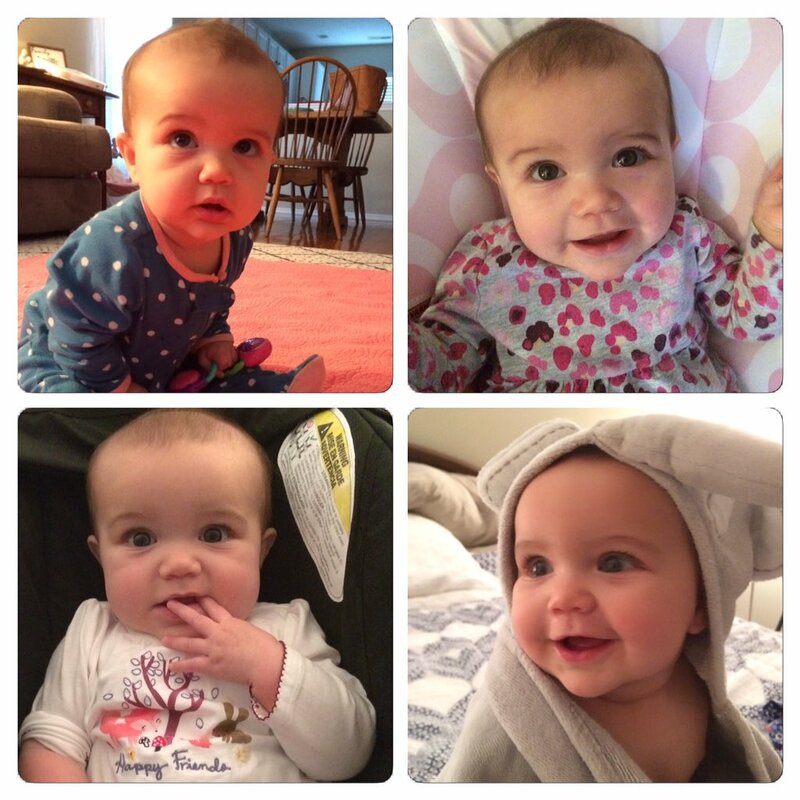 This is Sloan’s photo collage at 37 weeks. Ahhh…it feels great to be writing Thursday Rundowns again. I wish everyone a great first weekend of December and I thank you for reading Don’t Blink. Have a great night. Don’t Blink. I watch the news while running on the treadmill. This morning, I watched one of our Myrtle Beach stations report on two different studies. The first study stated that drinking four cups of coffee per day could have health benefits. Um, seriously? Besides making your body dependent on caffeine and staining your teeth, drinking four cups of anything (besides water) per day must be good for you, right? These random studies that come out all the time stating that drinking a glass of wine each night will make you live longer or eating a candy bar before going to bed will reverse aging always crack me up. The second study presented results that I have an easier time believing. It said that decorating your residence for Christmas will improve your mood throughout the holiday season. 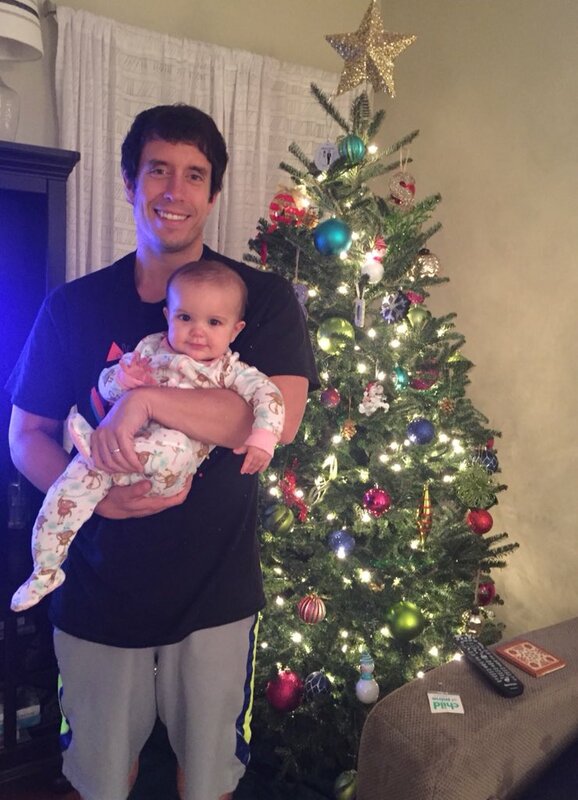 Our Christmas tree puts me in a good mood (well, holding my daughter puts me in a good mood too). When I watched this, I said to myself well, duh. I don’t think this study “discovered” a subtle trigger that makes people happy without them realizing it. I think we can all agree that most of us feel our hearts warm up when we are surrounded by lights, presents, and nativity scenes. However, I wish the study went further and told us exactly how much happier we become once we decorate our homes. I love arriving home to my house covered in red and green lights. For me personally, I know my mood improves drastically. Pulling into my driveway after work to green and red laser lights covering my home immediately gives me a shot of dopamine. Having a Christmas tree illuminate our dark living room before going to bed makes me feel warm and cozy. Listening to figurines that play classic Christmas carols transports me right back to when I was a kid. Christmas is the best time of the year for many reasons, one of them being the festive decorations that surround us. Although none of us needed a study to tell us that, I would argue that the obvious studies are a better use of time spent by our scientists than the questionable ones. Happy decorating! Don’t Blink. Getting a phone call from a solicitor is the worst. With the rise of cell phones and the decline of landline phones, the volume of solicitors clogging up the lines greatly decreased during the early part of the decade. However, it didn’t take long before “they” got a hold of cell phone numbers. For the past two years, I have probably received a junk phone call at least five times per week. Although annoyed at these calls, I never had the motivation to actually write a blog post on them. However, that changed when I received one this past Thursday. For those of you who didn’t read my numerous blog posts over the last two weeks referencing a certain holiday, last Thursday happened to be Thanksgiving. 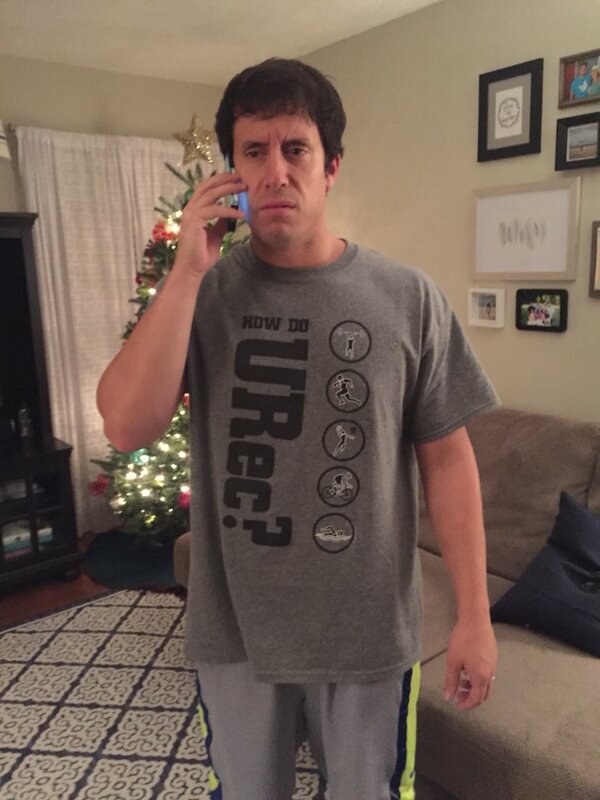 The tweet I sent out after getting an unwanted call on Thanksgiving. Really? Spam calls on Thanksgiving? Can’t these companies check a box within their robocalling software to cease phone calls on family holidays? Just a little privacy and respect would be nice. But these days it just isn’t the automated recordings and the inconvenient times they call that fire me up. Rather, it is the trickery and deceit that is used to make you answer them. Many of us have the obligation to pick up our phones when they ring. So even when a call comes in from a random town in a state I have never been to, I will usually answer it, knowing that a gimmick likely awaits me on the other line. These calls are annoying, but at least they are predictable. But telemarketing agencies have grown more sophisticated. They have found ways to bother the people who would normally press decline the second a spam call would come through. The first trick is calling from a local number. Even if the company is located in Texas AND calling from a Texas phone, their call still comes through with a Myrtle Beach (or whatever city you happen to be living in) area code. Of course most of us will accept a call that appears local. Another trick takes “calling local” a step further. These days, I get numerous spam calls from numbers that have the identical first three digits (not the area code but the actual seven-digit number) as my number. Although this method has now turned into an obvious indicator that it is in fact a solicitation, it did work on me the first couple times. Finally, you also get the “persistent callers.” You let a suspected spam call go directly to voicemail and then the number calls you back immediately after. Hmmm, you think, if they are calling again it must be a legitimate call. These methods are unethical because they mess with you. Someone calling twice might heighten your curiosity and fear. Or, you might be expecting an important phone call and answer the local number with high hopes, only for your expectations to be crushed. Or, you might excuse yourself from the office or a social function to take what you think is an important call. I wish spam phone calls didn’t make such a big comeback (or callback haha). You can sign up for as many “Do Not Call” lists as you want, the random telephone numbers will still find a way to show up on your iPhone screen under the Incoming Call heading. Although I am accepting of the fact that these type of phone calls are once again here to stay, can we at least get some peace and quiet on the holidays? Don’t Blink. Something came to reality this past week that I would count as a career highlight. Interestingly enough, it had nothing to do with social media or even digital marketing. Rather, it had to do with another skill I am passionate about. 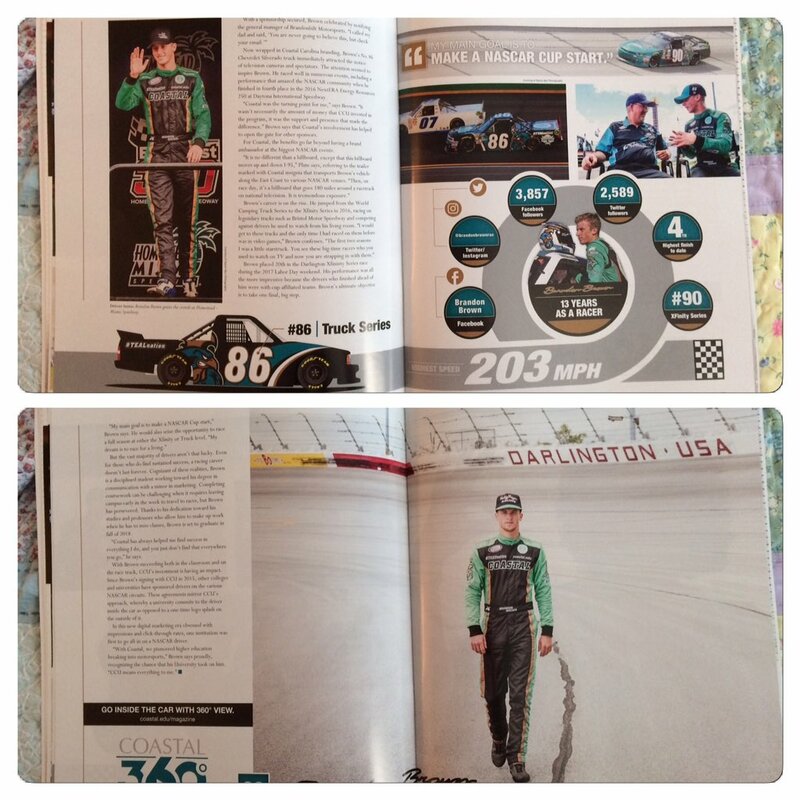 On Wednesday, I was delivered a copy of Coastal Magazine, the biannual alumni publication at Coastal Carolina University. For those of us who have any knowledge of colleges, we know that the alumni magazine at any university is one of that institution’s premiere showcases, a major periodical that is the result of hard work, extensive planning, and the efforts of many. 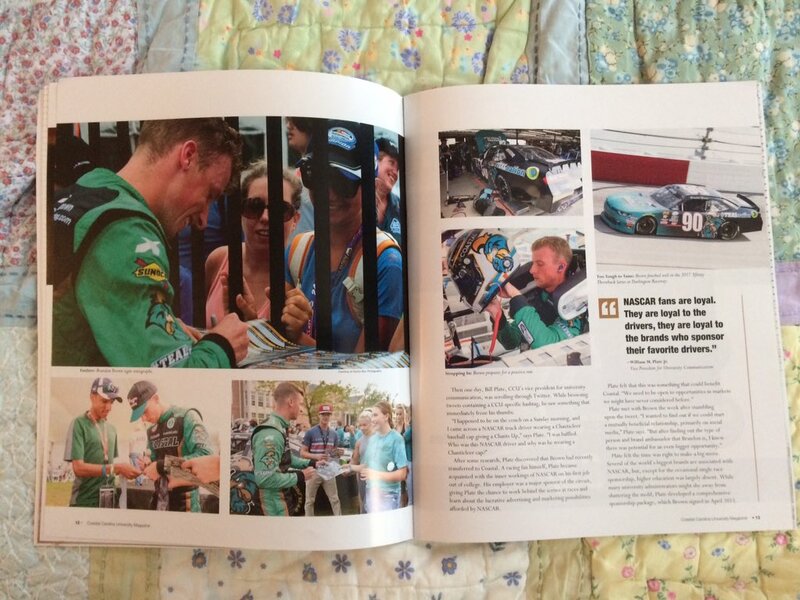 When I was delivered the latest issue, I held it in my hands and took a long look at it, staring at the intense-looking NASCAR driver on the cover. It became apparent that soon thousands of people would open the magazine and learn his story, reading the words of a grateful CCU staffer who was given the opportunity to tell it. This is the Fall 2017/Winter 2018 Coastal Magazine issue. 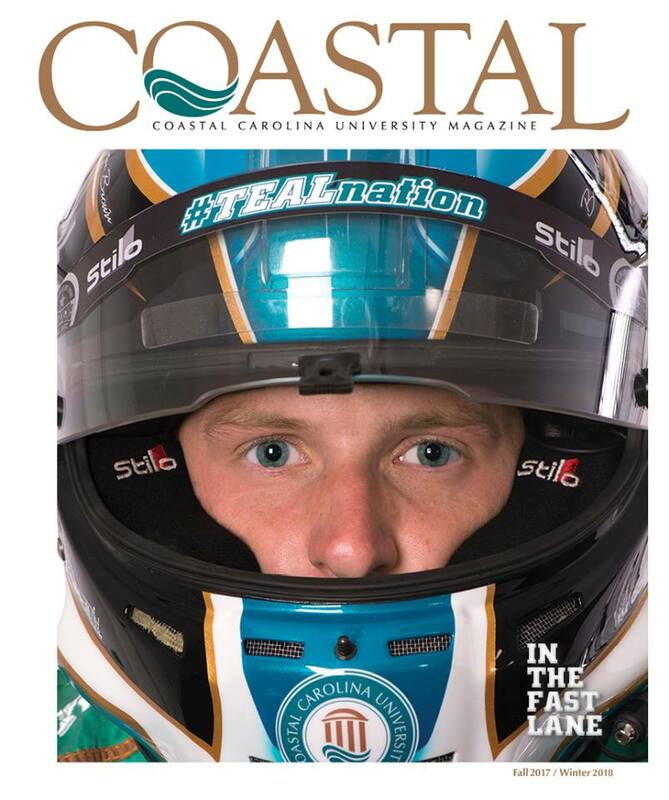 It was my honor to write the cover story for the Fall 2017/Winter 2018 issue of Coastal Magazine. It was cool to see my name underneath the title of the cover story. I accepted my position at Coastal Carolina because it gave me an opportunity to primarily focus on and manage the social media program of an entire university. However, I also made the best decision of my life because I knew I would be able to nurture other pursuits as well. 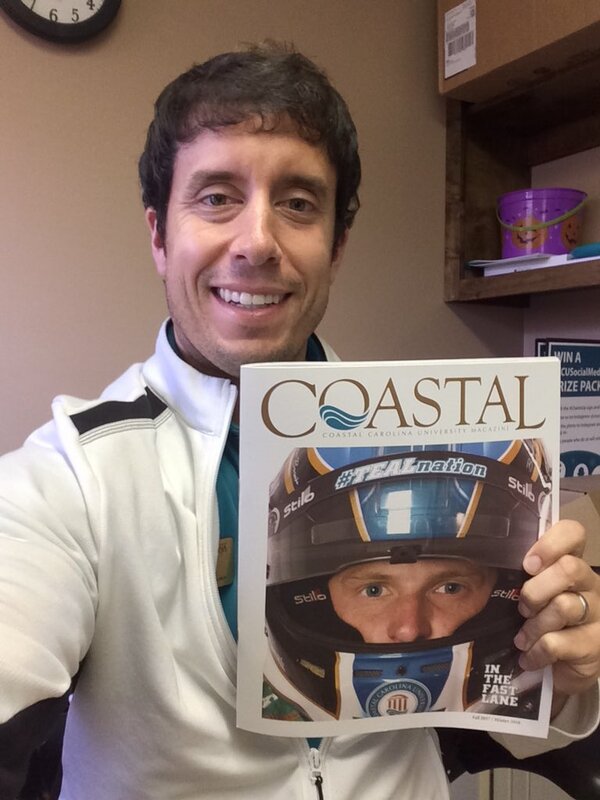 I had the honor of writing the cover story of the latest Coastal Magazine issue. I serve on the magazine committee at CCU. I have the pleasure of contributing a regular social media section to the publication and I have written shorter features for it over the past few years as well. However, this was my first time undertaking the task of writing the cover story. A look at the first several pages of the story. 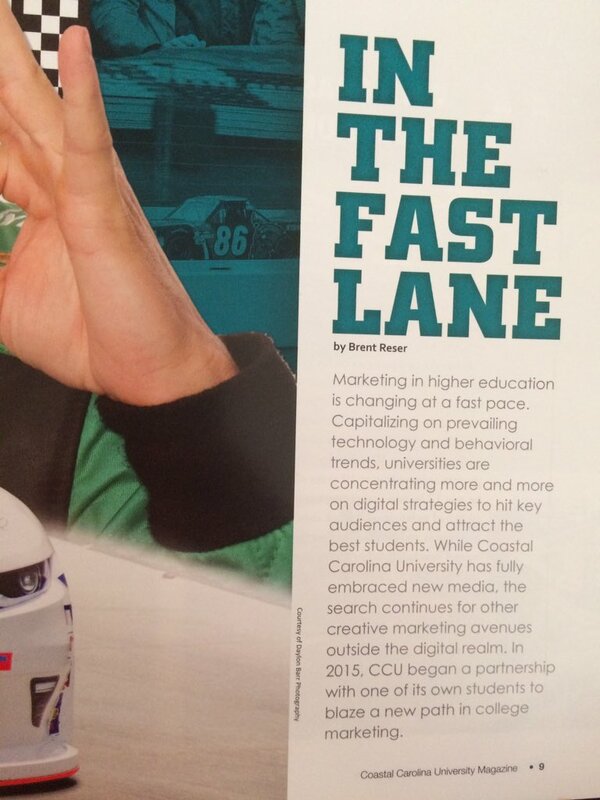 I was asked to write it on Brandon Brown, a student at CCU who happens to be a NASCAR driver. 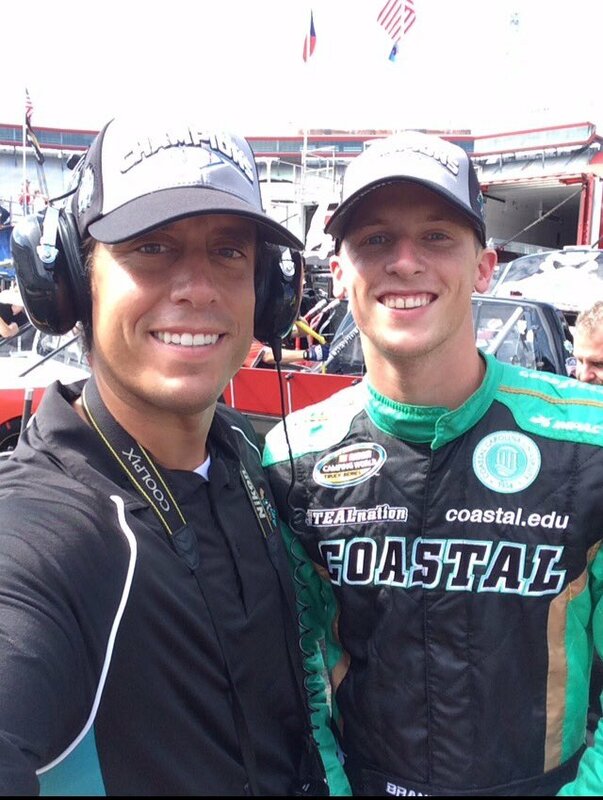 I have become familiar with Brandon as I have traveled to a couple of his races and reported on his accomplishments via our social media channels. Additionally, this summer, he worked in my office once a week, learning about what it takes to run a social media program at an institution of higher learning. Because of my familiarity with Brandon, I was a good candidate to write the story. When our magazine editor asked me to take on the project, I enthusiastically accepted. I have become familiar with Brandon over the past couple of years. After significant research, two in-depth interviews with Brandon, and hours composing the piece, I submitted the story. Our talented University Communication team took it from there. Doug Bell, the magazine editor I have mentioned (he also serves as the director of media relations), polished my piece and made it better. Our photographers contributed incredible images, including the cover photo, to bring the story to life. Our graphics team came up with the layout of the piece and created an outstanding infographic to explain Brandon’s successful career. Our video production personnel put together content that allows the Coastal Magazine digital audience to cruise around in the passenger seat with Brandon. A look at some of the photogaphy and graphics our talented team produced. 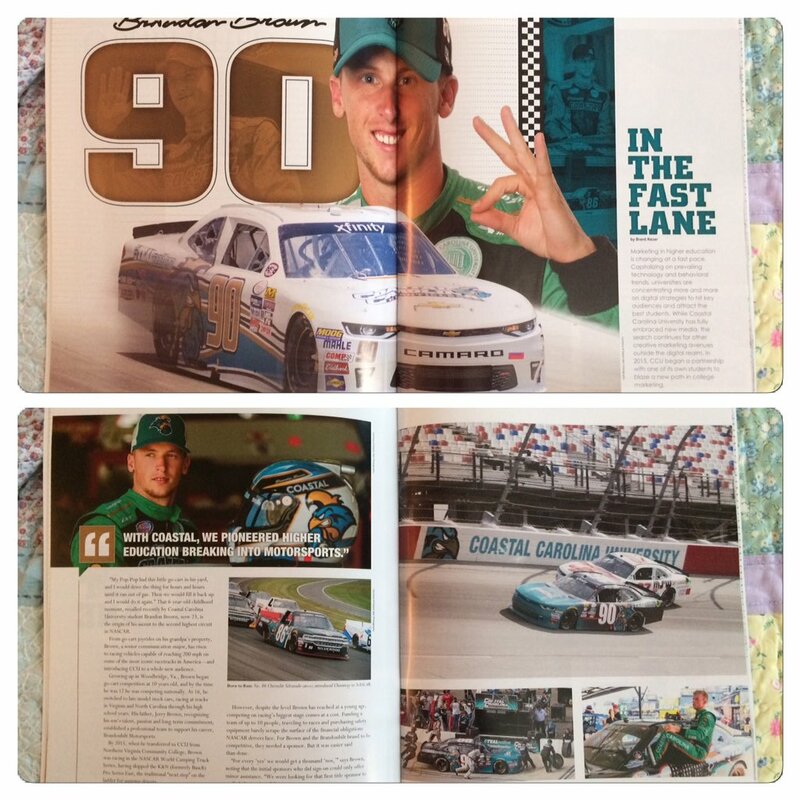 What resulted from the teamwork is a beautiful 10-page spread smack dab middle in the latest issue of Coastal Magazine. If not for the talents of my co-workers, the story of Brandon Brown would just be 1,000 words of text and no one would read it. To Doug, Rob, Regis, Scott, Judy, Jady, Ron, Caroline, Mona, Geoff, and others – THANK YOU! Thanks to all involved for making the story look so good. I realize I have a reputation as a blogger. I put together crappy top five lists and Thursday Rundowns. But underneath that blogging façade is a soul that enjoys the challenge of composing quality writing. I am thankful that I have an outlet to do that at CCU. Don’t Blink. Over the years, my blog has become synonymous with a stupid idea factory. Well, I have another one tonight. This time of year, we just don’t celebrate Thanksgiving anymore. As I have documented, Thanksgiving Eve is practically a holiday itself. Then, after Turkey Day you have Black Friday. Once that chaos is over we enjoy the Thanksgiving weekend, a time of football, drinks, and leftovers. A new week might start but the special occasions continue as people scramble to their computers for Cyber Monday. Finally, in a way to atone for our gluttony from the past week, some of us try to make nice by participating in Giving Tuesday. My question is this: Heck, why don’t we just make this string of days in late November run from Tuesday through Tuesday? It only makes sense, right? Of course that leads us to an even better question: What would we celebrate on Thanksgiving Eve Eve (aka the Tuesday before Giving Tuesday)? Does anyone have any good ideas? No one? Okay! Well I do. Let me pitch five brief options. Taco Tuesday – Take the most cliché, obvious promotion every single bar in America participates in and make it an actual national day (not one of those cheesy, gimmicky national days…today is National Stuffing Day by the way). This would be the Taco Tuesday of all Taco Tuesdays. Everyone in the country would go wild scarfing down tacos and bars would be able to count on two incredible days of business in a row. Levels of creativity pertaining to how to prepare a taco would go through the roof! The Day of Apology – This is a serious, wholesome idea I have. Perhaps the Tuesday of Thanksgiving week should be The Day of Apology. With the major holidays about to take place over the next several weeks, how nice would it be to celebrate them with friends and family with whom you have a clean slate with? Some people hate the holidays because there is so much anger and animosity brewing. On this day, everyone would be challenged to either call, text, or visit someone they have a strained relationship with. Although taking part in this day wouldn’t cost you a dime, it might be the most priceless gift you could give yourself and others during the holiday season. Pre-Thanksgiving Movie Day – Part of the reason why we get so excited for Christmas is because there are a million different movies related to the holiday that start playing immediately after Halloween. Using the same formula of using cinema to pump us up for Christmas, we would do the same thing for Thanksgiving. On the Tuesday prior to Thanksgiving, networks would play only Thanksgiving-themed movies and movie theaters would offer free screenings of Turkey Day films. This would put people in more of a Thanksgiving mood and generate a healthy buildup to Thanksgiving. This would also place a premium on filmmakers to create movies that actually center on Thanksgiving (because, to be honest, I really don’t think there are that many). Dress As a Turkey/Pilgrim Day – Most of us work or go to school on the Tuesday before Thanksgiving. What better way to boost office morale than to dress up in Thanksgiving-inspired garb? This would get people excited for Thanksgiving while at the same time letting people get creative. Not to mention it would be a hit on Instagram! It would be just like Halloween…but not really. Americana History Day – If you want to know the trends, culture, and attitude of America in a given time period, all you have to do is watch the Macy’s Thanksgiving Day Parade during that particular year. Each year the parade is a slice of red, white, and blue contemporary pop culture. During each Americana History Day, a different year would be designated (i.e. 1972). So, if next year we celebrate it for the first time, all schools across the nation would be required to show the 1972 Macy’s Thanksgiving Day Parade in class. A discussion would follow. Workplaces would be encouraged to show it during lunch. NBC would show the ’72 parade during primetime and MSNBC and CNBC would show it non-stop on repeat throughout the entire day. Americana History Day would not only teach us a lot but it would garner more viewers for the newest edition of the parade on Thursday. What do you think? My personal favorite is The Day of Apology. Although today is not a holiday yet, if your favorite blogger has anything to do with it, that might change in the future. Don’t Blink. This morning, I stood out in the lobby as I waited for a meeting to start. A vending machine caught my eye and I took a long look at its contents. 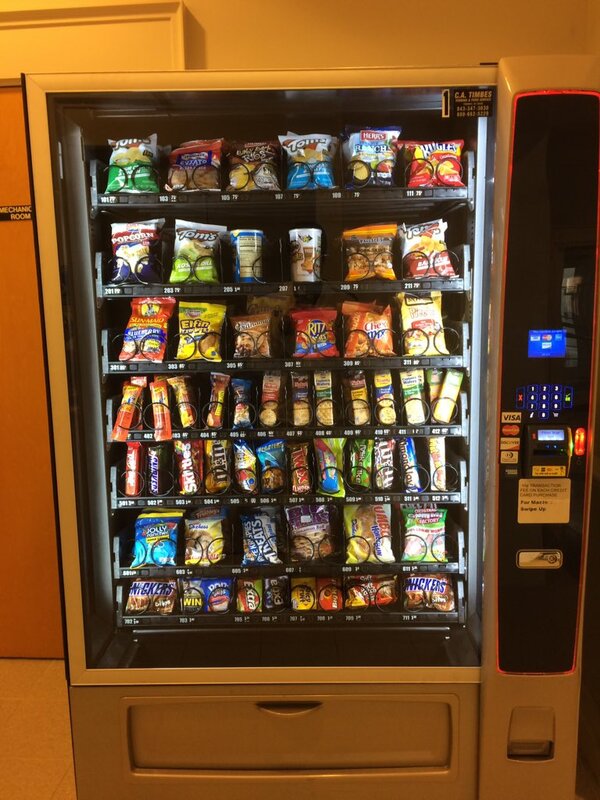 I thought to myself, this machine has some really good snacks! I couldn’t help but take the below photo. I encountered this vending machine today. Time to hold a draft! Tonight I want to rank the various snacks according to the order in which I would purchase them. A couple notes: The machine happens to have 57 different spots (my lucky number). Out of those 57 spots, five snack options are offered in two different spots (i.e. you can find Snickers Bites in #702 and #711). Also, as I sit here on my couch, there is one snack option that I can’t identify (#205) from the photo. Rather than leave my home and go back to campus to figure out what it is (my wife would not be pleased), I am just eliminating it from the draft. Thus, this draft will have 51 rounds. Here we go. 1. Lance’s Peanuts – My go-to snack in any vending machine is a bag of salted peanuts. No questions asked. My #1 every single time. 2. Peanut M&M’s – Why not throw a layer of chocolate on those peanuts? 3. Cheddar Chex Mix – I love salty snack mixes, especially ones that have cheese added. 4. Snyder’s Hot Buffalo Wing Pretzel Pieces – These are tasty and have a great crunch plus they pack some heat. You don’t always find these in vending machines. 5. WhatchaMaCallIt – Speaking of rare finds, you don’t find this candy bar that often in stores, let alone vending machines. Chalk its high ranking up to nostalgia. 6. Mike & Ike – These go a long way. Fruity and light, Mike & Ike will keep you snacking for longer than your average candy choice. 7. Plain M&M’s – Can’t hold a candle to its brother (Peanut M&M’s) but still pretty good. 8. Strawberry Pop-Tarts – Did you know I like Pop-Tarts? My first choice out of the breakfast options available in this machine. 9. TGIFridays Bacon Ranch Chips – Used to get these out of the vending machine when I worked for Grizzly Athletics. Satisfying snack. 10. Grandma’s Chocolate Chip Cookies – You get two decent-sized cookies in the pack. If I kept milk in my office I might get them more often. 11. Ritz Bits (Cheese) – Another item that is perfect for snacking on, I loved eating these as a kid and still do as an adult. 12. Twix – My wife’s favorite candy bar. I can purchase it from the vending machine and eat one of the bars for myself and give the other to Sid when I walk through the front door after work. 13. NeKot Lemon Crème Cookie Sandwiches – Reminds me of Lemon Oreos. That’s a good thing. 14. Lance’s Popcorn – Vending machine popcorn is underrated…trust me. 15. Bugles – How can you not enjoy this crispy, salty snack? Only disadvantage of going with Bugles is that the vending machine pack doesn’t contain very many of them. 16. Snickers Bites – I like Snickers but I like it even more when it is broken down into a snackable, shareable option. Although on the expensive side, these are good. 17. Big Texas Cinnamon Roll – Definitely not a Cinnabon but still pretty good. Of course that depends on how long it has been in the machine for. 18. Soft Batch Cookies – Never had these before but if I was craving chocolate chip cookies and the machine was all out of Grandma’s (see 10) I would go with them. 19. Toasty Peanut Butter Crackers – I love peanut butter. 20. Nekot Peanut Butter Crackers – Toasty (see 19) just sounds better than Nekot, okay? 21. Almond Joy – Some people despise Almond Joys but I find them enjoyable. Another choice that you can share. 22. Snickers – Although my first option would be Snickers Bites (see 16), the original bar isn’t a bad alternative option. 23. Extra Watermelon Gum – Who doesn’t want watermelon flavored breath? 24. Skittles – Who doesn’t want rainbow flavored breath? Ah, I will go with watermelon. Although I have no problem with Skittles, I will always choose chocolate candy first. 25. Rice Krispies Treat – I really enjoy any type of rice krispies treat but in the past when I have gotten this out of the vending machine it has been on the hard side. 26. Extra Wintergreen Gum – If I had an important face-to-face meeting with someone, I would purchase a pack of this gum. 27. Pizza Pringles – I love all the different types of Pringle flavors out there. The pizza variety wouldn’t be my first or last choice. 28. Nature Valley Peanut Butter Protein Bar – You had me at peanut butter. 29. Elfin Crackers – Don’t have a passionate opinion one way or the other, would probably just be something decent to munch on. 30. Baby Back Ribs Chips – Every now and then I can go for a bold flavor such as these. 31. Kit Kat – Give me a break and pass me a Kit Kat only if it is the last chocolate option in the vending machine. 32. Airhead Bites – Airheads were fun as a kid…not so much anymore. I just taste pure sugar. The fact that they are bites intrigue me though. 33. Juicy Fruit Gum – Enjoy the taste of this gum even if it only lasts for a minute. 34. Duchess Cinnamon Roll – Looks much less tasty and quite a bit smaller than the Big Texas (see 17) cinnamon roll. 35. Tom’s Barbecue Chips – I enjoy barbecue chips every now and then, just not usually at work. 36. Nature Valley Fruit Nut Bar – This would be my #1 option if I was looking for something healthy. 37. Planters Tropical Fruit and Nut Mix – More expensive than the fruit nut bar (see 35), it doesn’t sound awful but would probably be something I would go for only if I was on a health kick. 38. Lances Cheddar Cheese Crackers – Take them or leave them. 39. Big Red Gum – My lowest ranked gum in the vending machine. I have nothing against chewing it but it just doesn’t stand out. 40. Sour Gummi Worms – Not a fan of sour candy. It is saved from dropping further down solely because I like original gummi worms. 41. Tom’s Sour Cream & Onion Chips – Would never buy these at the store so I would rarely buy them from a vending machine. 42. Sweet Tarts Chewy Sours – Could be a good study snack but you know how I feel about sour candy. 43. Lance’s Cream Cheese & Chives Crackers – Combination is not my cup of tea. 44. Jumbo Honey Bun – Perhaps decent out of the oven at the factory, I prefer to stay away from old, hard, sticky pastries. The cinnamon rolls above (see 17 and 33) have frosting and are more visually appealing. 45. Creamy Ranch & Habanero Chips – I try to stay away from ranch-flavored snack foods. Just a personal preference. 46. Sunmaid Blueberry Greek Yogurt Chips – Do I look like someone who eats Greek yogurt? In all fairness, I have never tried these before. 47. Tom’s Kosher Dill Pickle Chips – Another chip flavor that I am not fond of. 48. Jolly Rancher Hard Candy – I have discussed Jolly Ranchers before and I don’t really understand their appeal. I can appreciate one piece but I don’t need an entire pack. 49. Tom’s Vinegar & Salt Chips – I can’t tolerate the smell of salt and vinegar chips, let alone phantom what one actually tastes like. 50. Wallace’s Pork Skins – A snack that just makes me quiver. Don’t know what it is, but just the sight of pork skins, especially in a vending machine, turns me off. 51. Hannah’s Red Hot Sausage – I will never in my life purchase/eat meat from a vending machine. Have I jumped the shark or just come up with a really creative blog post? Regardless, thanks for sticking around for my 51 round draft. What would be your #1 pick? Don’t Blink. We are right on the verge of Thanksgiving week and I couldn’t be happier. 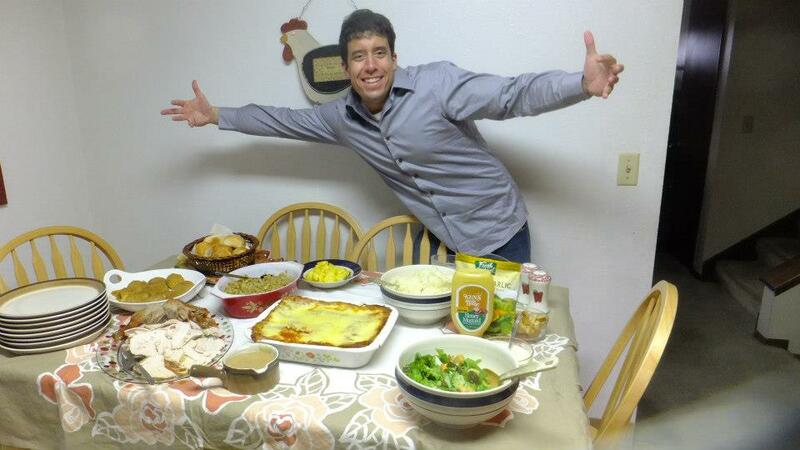 I am a big fan of Thanksgiving and have racked up so many fond memories from the holiday over the years. Sure, it is Sunday and that means we must go back to work tomorrow but not for long. I think we will all walk into the office Monday morning with motivation to plow through the next few days and then get home to celebrate our blessings. Over the years, I have written extensively about Thanksgiving via Don’t Blink. Today, to get us all excited for this special holiday, I want to re-share some of my greatest hits. If you read this post and the accompanied linked posts, I guarantee that you will be so fired up for Thanksgiving that you might host your own Macy’s Day Parade smack dab in the middle of your neighborhood streets tonight. 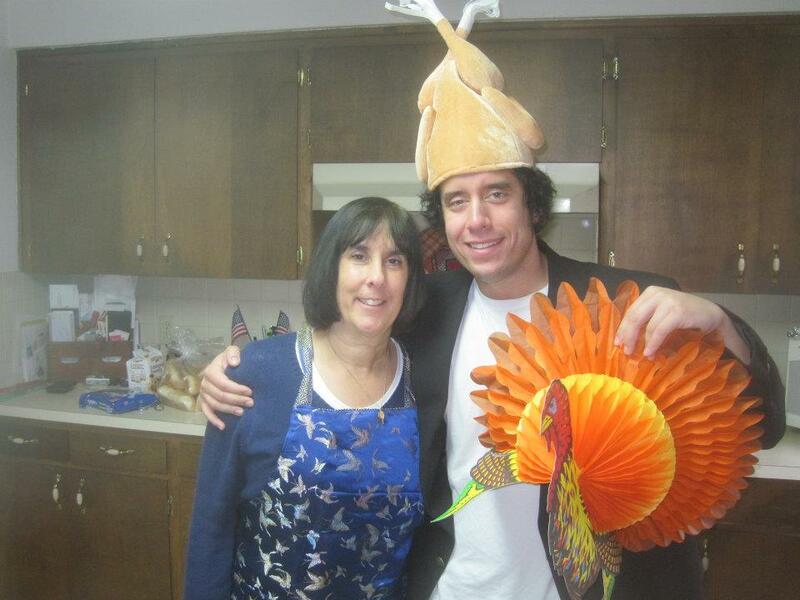 My mom and I both love Thanksgiving. 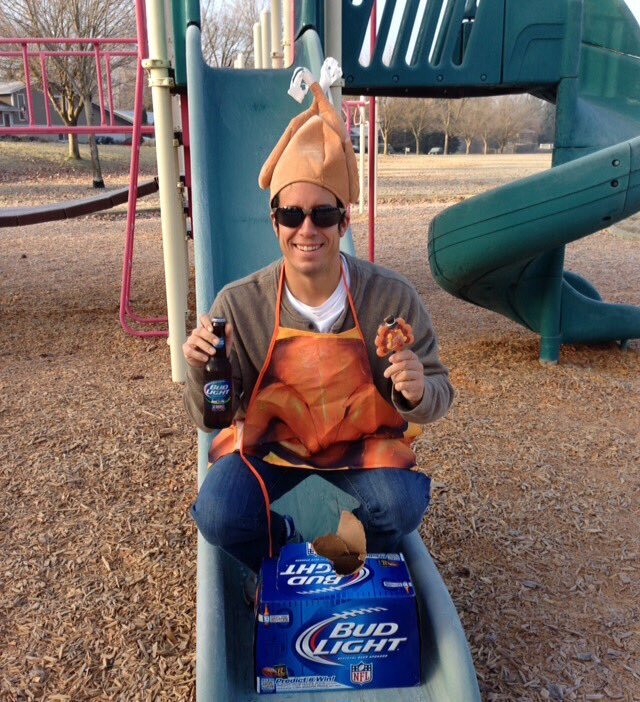 Are you ready for another great Turkey Day? The Official Start of the Holidays – When you wake up tomorrow morning, it just won’t be Thanksgiving week. Rather, it will be the official kickoff of the holiday season. In my book, I consider the Monday before Thanksgiving the start of the glorious winter holiday season. Starting tomorrow and lasting through New Year’s Day, we will all enjoy 42 days of festive fun. In this particular blog post from over five years ago, I give a preview of the joy and magic that await us all. Thanksgiving Eve – Like it or not, Thanksgiving is associated with the biggest party day of the year. The Wednesday that precedes Turkey Day, AKA Thanksgiving Eve, is notorious for sleepy neighborhood watering holes transforming into party bars filled to capacity with eager college students and other people marking their triumphant returns to their hometowns. The excitement of the start of a long weekend combined with the nostalgia of being back at mom and dad’s brings out the party animal in many. 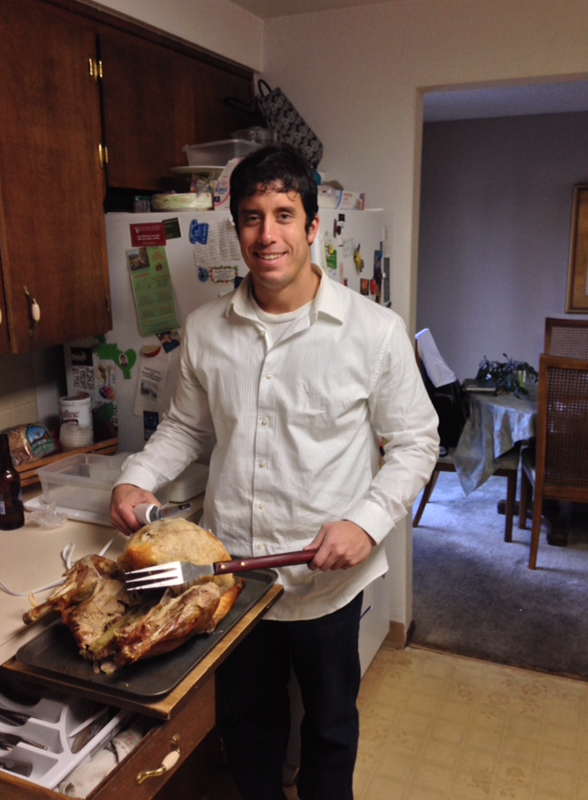 Last year, I wrote about my own Thanksgiving Eve memories. 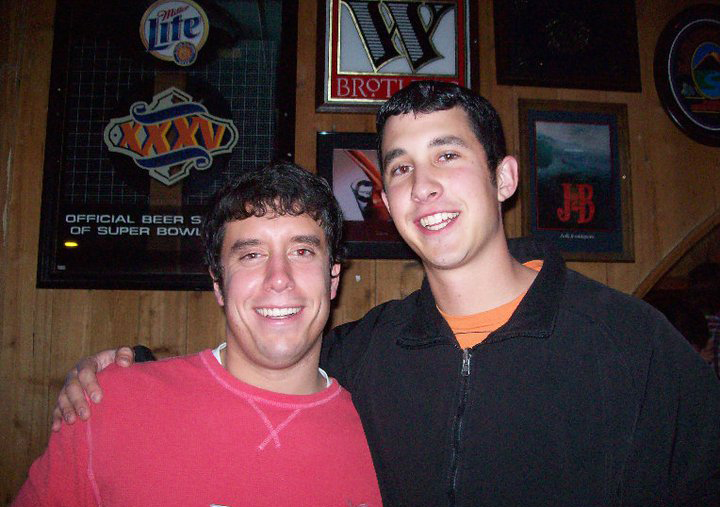 My brother and I out on Thanksgiving Eve in 2010. Thanksgiving Traditions – Eating something sweet for breakfast, watching the Macy’s Day Parade, and enjoying ham with the turkey are all new Thanksgiving traditions that I enjoy with Sidney. Of course, before I met Sid I practiced some older traditions with my family. Days before I celebrated my first Thanksgiving in Myrtle Beach, I wrote about some of those traditions we held dear and how Sidney was going to try to incorporate some of them into our east coast celebration. We all have our own unique Thanksgiving traditions and they are a major reason why the holiday is so special. We all have our Thanksgiving traditions. Growing up, my family would always have lasagna as part of the Turkey Day spread. TURKEY – Turkey, turkey, turkey, turkey. What is the first thing that pops into your head when someone says Thanksgiving? If you don’t say turkey, I am calling you a liar. Thanksgiving is synonymous with this particular bird that is the headliner of any Turkey Day feast. How much do I love it? Quite a bit! In 2016, I wrote about my favorite holiday meats. How does turkey match up against prime rib and ham? You will have to read to find out. You can’t have Thanksgiving without turkey. Are you in the “turkey” spirit now? Let me be the first to wish you a joyful Thanksgiving week. If you happen to be traveling, please arrive at your destination safely. Thanks for reading Don’t Blink and have a great Sunday. 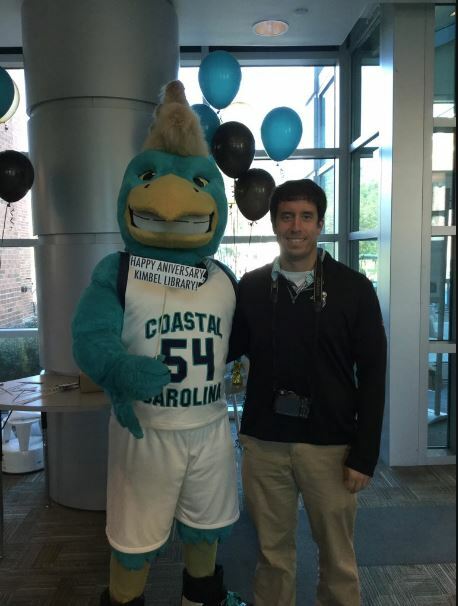 Kimbel Library Anniversary – Whenever I can get a photo with our mascot you can bet that it will make the rundown. Yesterday, our library on campus held a celebration. Kimbel Library marked its 40th anniversary with cake, games, and CHAUNCEY. While covering the fun, I snapped this photo with our extrememly unique Canterbury Tales-inspired icon. This is a photo of me with Chauncey at yesterday’s Kimbel Library 40th anniversary celebration. #GrizCat Football – The 117th Brawl of the Wild is this Saturday in Bozeman, MT. Some of my best times working for Grizzly Athletics occurred inside Bobcat Stadium after Montana crushed Montana State. Even though extremely lopsided to the point that it is a joke, this rivalry is a lot of fun. I won’t have the opportunity to watch the game with my fellow east coast Grizzlies (and Bobcats) this year but I will definitely be following the action in Myrtle Beach. GO GRIZ! The Brawl of the Wild has a traveling trophy that stays with the winner. Let’s just say it spends a vast majority of its time in Missoula. 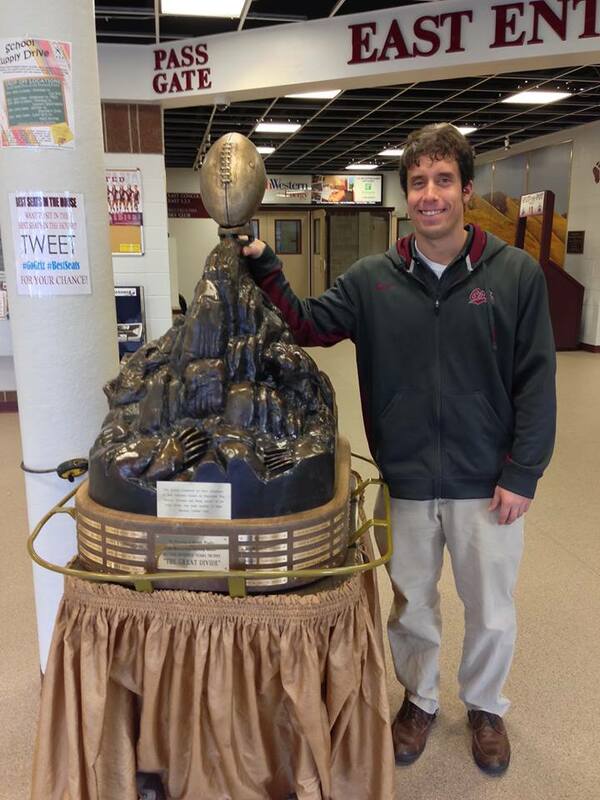 This is me with the trophy in 2013. 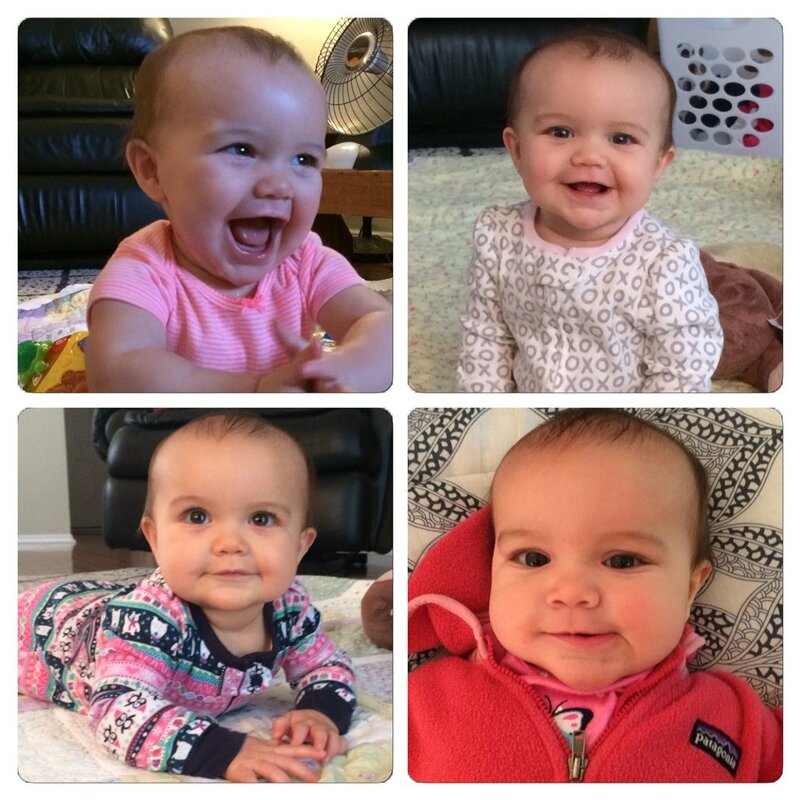 Here is Sloan’s photo collage at 35 weeks. 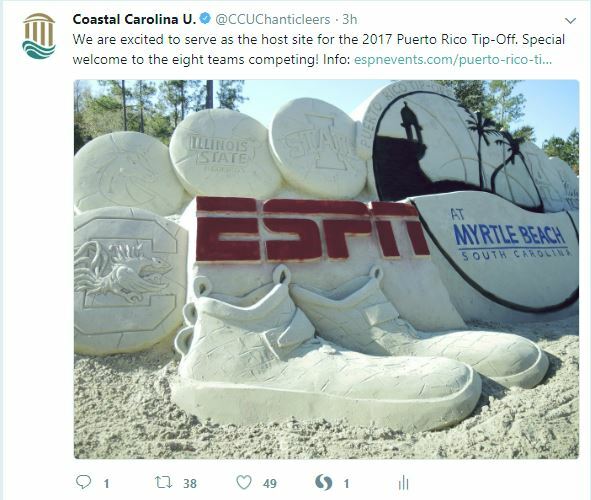 #CCU Helping Out – A popular tournament early on in the college basketball season is the Puerto Rico Tip-Off. It draws marquee teams and ESPN coverage. However, because of the destruction that Hurricane Maria inflicted on the country, it was not possible to hold the tourney in Puerto Rico. Scrambling to find somewhere else to play, the organizers of the event graciously accepted the offer from Coastal Carolina University to hold the tournament on our campus. The games started this morning and eight teams are participating (Appalachian State, Boise State, Illinois State, Iowa State, South Carolina, Tulsa, UTEP and Western Michigan). As in the past for other big basketball tournaments, a giant sand sculpture was made to welcome the squads and fans. A few years ago, I specifically wrote about the sculpture that was created for the Big South Conference tournament. From The Archives – With NFL Thursday Night Football receiving so much heat these days, I want to remind everyone that I have been against the idea for a long time. Two years ago on this date, I wrote about how the Thursday night games do nothing but oversaturate the product and take all the luster away from the once coveted Thanksgiving games. Three years ago on this date, I wrote about why I forced myself to go watch “Dumb and Dumber To” in the theater even though it looked horrendous in previews. 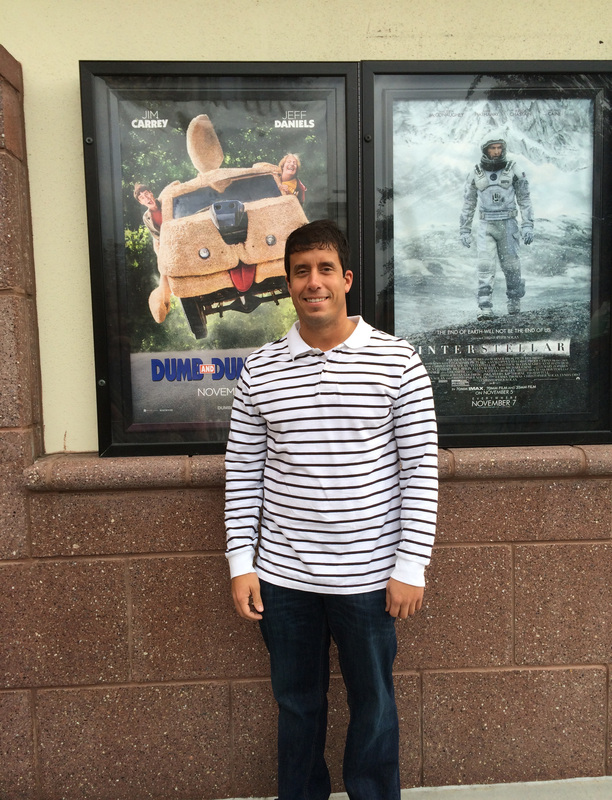 Outside the theater before watching “Dumb and Dumber To” in November of 2014. From the Reser household to your household, I wish you a great weekend. Start saving up your appetite now for next Thursday. Don’t Blink. So, what do you think about the holiday-themed inflatables all your neighbors seem to have in their front lawns these days? Let’s discuss it tonight! Today’s “Blondie” comic strip addressed holiday lawn inflatables. I hate to use another Blondie comic strip in Don’t Blink but the latest installment directly addresses this evening’s issue. For those who can’t see the above strip clearly on their device, let me briefly explain it. Dagwood is in a car with co-workers. As they drive, they pass various houses with Christmas inflatables in the yards. One by one, the co-workers describe the decorations as “tacky.” Dagwood agrees. However, when they arrive at Dagwood’s residence, the folks in the car see that he has an inflatable of a pilgrim saddled on a turkey in his yard. When they question him about this inconsistency, Dagwood responds that he agreed Christmas inflatables were tacky, not Thanksgiving inflatables (hahaha). In my opinion, I don’t find any of the popular holiday lawn inflatables tacky. Unoriginal in some cases? Perhaps. But not tacky. 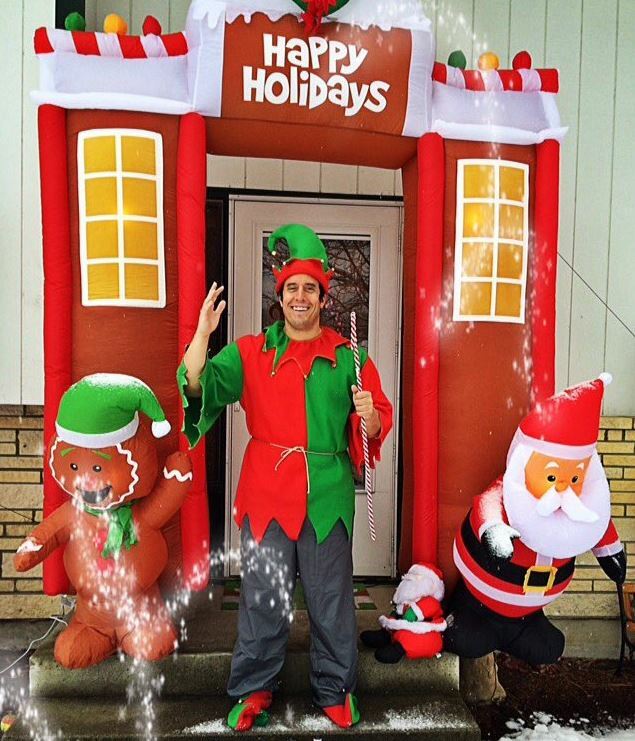 Some holiday inflatables are pretty cool, especially ones where a real life elf lives at. I love Christmas decorations. 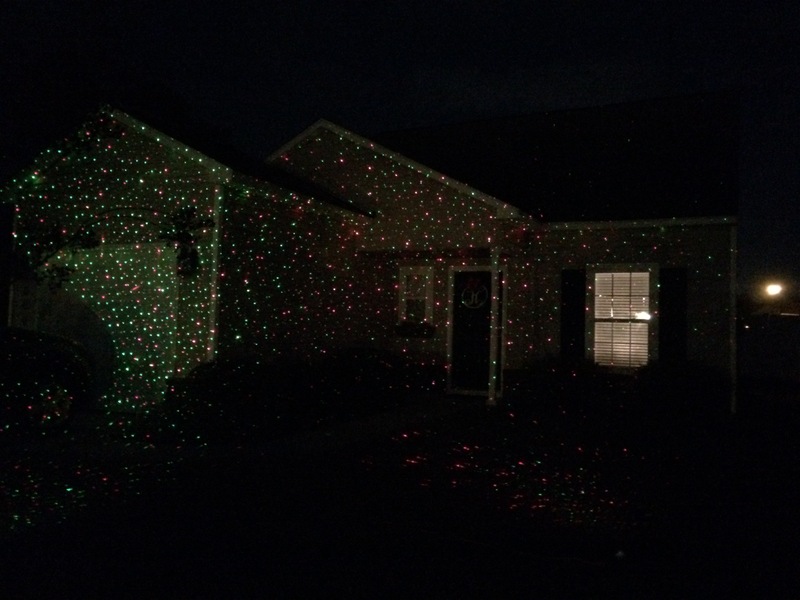 Although we don’t have an inflatable in our yard yet, we will once again have laser lights projected onto our house. Thus, we do follow some of the Yuletide decorating trends, we just haven’t gotten around to forking over the money for a giant blow up Santa. I appreciate the holiday inflatables because they show effort and holiday cheer. Those who purchase and install these decorations are boldly proclaiming that they are fans of the holidays. Come on, someone who is a Grinch isn’t going to waste a dime or two minutes bothering with a blown up stable of reindeer, right? When I drive down the street and I see an inflatable in someone’s yard, I think, that person is really in the Christmas/Thanksgiving/Halloween spirit. I like that. Some holiday inflatables are pretty basic, others are more involved. 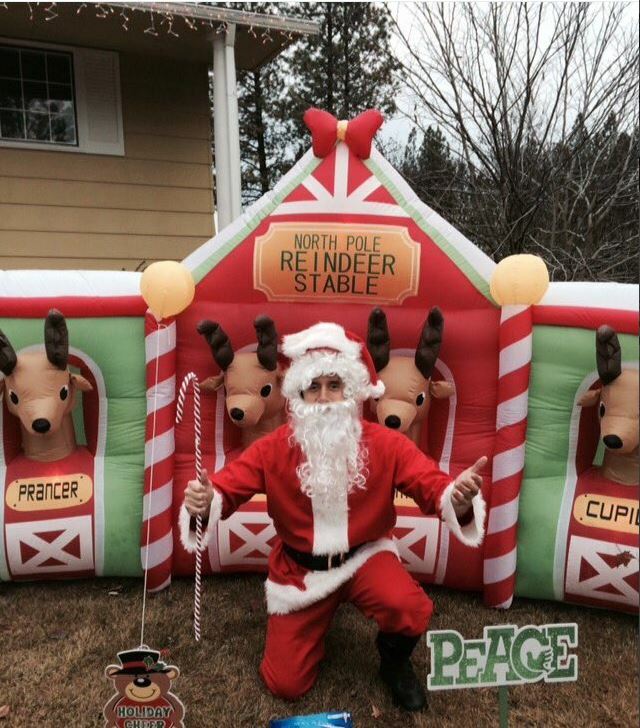 I took this photo in front of a reindeer stable blow up in my parents’ neighborhood three years ago. It makes me connect with the person a bit because they obviously have an affinity for these special times of the year, just like I do. I admit, some of the inflatables do get a bit repetitive. I also concede that they are an eyesore when they are deflated. Nothing is more pathetic than a shriveled up Santa strewn across someone’s lawn. But when they are blown up to capacity in their full glory and it is in the middle of the holiday season, I have absolutely no problem with inflatables. What is your thought on these decorations? Like them or hate them? If you are a Scrooge regarding this issue, please release your anger by commenting on this post or on my social media channels as opposed to going around your neighborhood with a sharp edge. Don’t Blink.